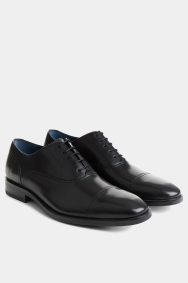 These sophisticated Oxfords are a versatile choice for formal dressing thanks to their black leather finish. Whether you want to wow at an evening event or dial up the smartness on an office look, they’re a classy footwear option. Pair with a 3-piece suit for an effortlessly polished wedding look or with a sharp textured suit for an outfit that means business. The shoes dig into your feet causing blisters. The back part of the leather is very hard and too low and doesn't get that much softer over time. Ended up throwing these shoes out. Great service as always and the shoes are very well made, with good quality leather and finishing. They fitted very well and there's nothing really I can complain about. Would definitely recommend Moss to anyone and everyone. Great. I love these shoes and think they look really good. 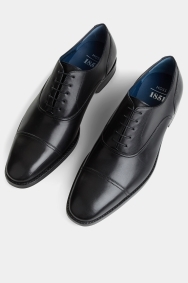 They can get a bit uncomfortable on the flat of your foot after walking around in them a while but perhaps the same can be said for any dress shoe. I really like these shoes and am thrilled with my purchase. They can be a little uncomfortable to walk in for extended periods of time - not for being an ill-fit but simply not to having much cushioning - but perhaps that’s a given with any dress shoe as my lack of experience would keep me from knowing for sure! 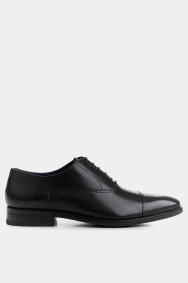 I really liked these shoes but they were larger than what I was expecting so I did not get a true fit to test, but as far as I can tell, they are really nice shoes. I’d like to reorder in the correct size!